Now brace yourselves for a shock: I'm about to confess to something deeply personal. In the wee small hours of the morning I plan, in meticulous detail, a wild, reckless and infinitely satisfying robbery. The details are vital. I linger over them on my journey to Green Park tube station and the gentle, civilised stroll through those most civilised of all London streets that take me at last to Bond Street. Alternatively I travel in the deep leather luxury of a lengthy limousine reminding myself that Bond Street was the creation of wily property tycoon Sir Thomas Bond in 1686  a man who understood luxury all too well. The journey gives me time to consider that in old Bond Street and New Bond Street (est.1700-1721) all that is finest, purest, most luxurious and most costly is to be found gathered together in this quintessentially elegant and English neighbourhood. A veritable shopper's Nirvana. This is the "very good part of town" described by Feilding in Tom Jones (1749). This is where the fashionable Bond Street 'Loungers' first paraded themselves under the tutelage of the Duchess of Devonshire in 1717 and where Byron dawdled at the Alfred Club and where Lord Nelson, his mistress lady Hamilton, Laurence Sterne, Boswell, Sir Thomas Lawrence and Sir Henry Irving were just a few of the scores of celebrities to have dillied, dallied, loved and lived here in years gone by. But I have this crime on my mind and I'm heading for that most fascinating and most magnetic Mayfair attraction  Asprey of Bond Street. Established in 1781 Asprey's are still dedicated to providing "articles of exclusive design and high quality, whether for personal adornment or personal accompaniment, to endow with richness and beauty the tables and homes of people of refinement and discernment". They said all that about themselves at the Great Exhibition of 1851 organised at the Crystal Palace by Prince Albert. But Charles Asprey's words then are still honoured to this day by his great-great-great grandsons who continue the tradition of excellence. Under the inevitable Royal Coat of Arms, 'By Appointment to H.M. The Queen, Goldsmiths, Silversmiths & Jewellers'  and also by appointment to the Queen Mother and the Prince of Wales for good measure  stands the uniformed figure of a commissionaire. Mr Tom Farra is flanked on either side by yards and yards of vast, mouthwatering window-displays making up the shop-fronts of No. 166-169 New Bond Street and round the corner into Grafton Street as well. In my fantasy at least Mr Farra turns a blind eye to my obvious intent, calmly supervising the various needs of customers, chauffeurs and piles of gift-wrapped packages, giving an equally unruffled and courteous greeting to monarchs, stars, statesmen and tycoons  a welcome accorded to the celebrated and uncelebrated quite impartially. Effortlessly the twin semi-circular swing doors are pulled back and there, stretching into the distance, is one of the most sensational sights to be seen in London. Gleaming, glittering, enticing and beguiling is a vast expanse of unique craftsmanship in gold, silver, leather, porcelain, glass, brass, precious stones and rich mahogany. "Can I help you?" asks an aide discreetly. "Would you mind if I helped myself instead?" I reply. To the right is modern silver, jewellery, watches and the innumerable small, exquisite items that range from money-clips to bejewelled shirt-studs; from cuff-links to the first item on my shopping list  a £15,000 gold wristwatch with a perpetual calendar  so rare that Asprey's only have two or three for sale each year. Beyond that is the exotic and self-explanatory Gold Room leading on to displays of birds and beasts in gem-encrusted precious metals that are the unique products of Asprey's own workshops three floors above. To the left are galleries of porcelain. Royal Worcester ranged against the brilliant colours of Herend's hand-painted animals which lure the visitor towards the rich aroma of the leather-goods department with as fine a range of bags, wallets, desk-sets and attache cases as can be found anywhere in London. In fact it was leather goods that started the Asprey family on its way to fame and fortune in 1871 and took them to their ever-expanding showrooms in Bond Street in 1847. They were then specialists in sumptuous dressing cases made in wood or leather, lavishly equipped with the dozens of silver-topped jars, pots, brushes and button-hooks which the Victorians found so indispensable at home or on their horse-drawn travels. The combined skills of Asprey silversmiths, cabinet makers and leather craftsmen started a slow but steady acquisition of age-old skills which still find ready markets (at a price) today. In fact the secret of the Asprey success story has been their resolute policy of buying up their competitors, acquiring their expertise and extending the range of products so that there's scarcely any luxury item not now made by them or for them. So the 17th and 18th Century Huguenot refugees named Asprey who settled in Mitchham, Surrey, as calico printers, tin smiths, braziers and hemp dressers have come a long way. They did it by acquiring the Edwards firm of dressing-case manufacturers in 1859 for example. out went the chief competitor and in came new craftsmen. They did the same in 1888 when they took over the Piccadilly firm of Leuchars and inherited jewellers, enamellers, goldsmiths and silversmiths  as well as a trade outlet in Paris. In 1906 they took over the rival firm of high class leather goods manufacturers, Houghton & Gunn, who also specialised in stationery, while in 1911 they absorbed watch-makers when they bought William Payne & Co.
And all the time they only acquired the best, picking up Royal Warrants and a whole constellation of European Kings, Queens, Princes and Emperors as customers along the way. Not surprisingly they were warranted suppliers to Queen Victoria and her heir, Edward Vll by the dawn of the 20th Century. They were elegant days. 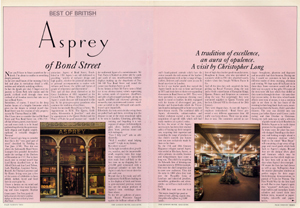 As one old Asprey's employee remembers: "Bond Street presented a very different appearance then. All traffic was horse-drawn. There was no omnibus or taxi. The customers arrived in carriages  broughams, phaetons and dog-carts and invariably had their footmen. During one day I would see customers in here in three different modes of dress: morning, afternoon and evening. We kept open till half past six in those days. Some customers would call in on their way to a party to buy gifts." "Of course all the men wore silk hats which they doffed as they came in through the door  the same door that you see today. At that time, when Guards officers were men of means, it was a common sight to see them in the late hours of the morning in their long, black frock coats, escorting actresses from the Gaiety, Daly's and other theatres. The year was divided into two seasons: just before Easter until Cowes (yacht racing) and then October to Christmas. Among my early tasks was to take a selection of goods to Lord Rosebery in Berkeley Square so he could choose presents for his grandchildren." In many ways the place has scarcely changed. Standing at the doorway and looking straight ahead is the sumptuous staircase which leads to the raised "Boat House", still containing a huge array of luggage and travel goods which hark back to Asprey's origins. Beyond that are the antique silver, glass and furniture which may be antiques now but which might easily have been sold as new in the days when Asprey's first emerged. Of course the firm has had downs as well as ups. Suffragettes chose the massive plate-glass windows as perfect targets for their angry brick-throwing demonstrations in pursuit of votes for women. The First World War hit the firm hard as well. But in true Asprey's spirit they 'acquired' shell-cases, German bullets and incendiary bomb cylinders and turned them into fashion items, mounted as paper-weights, ink-wells and paper knives. Miraculously the firm hung on to its skilled craftsmen and survived long enough to cash in on the phenomenal new demand for art deco trinkets and accessories. By this time oil-rich Americans had replaced maharajas, English aristocrats and European royalty as Asprey's most valued customers. Millionaires such as J Pierpoint Morgan spent fortunes there and it was inevitable that the firm set up an American trading post at the New York Saks Fifth Avenue store. Almost all the goods sold were individually made to the customer's requirements (just as they can still be custom-made today) and despite a minor hiccup during the Wall Street crash and world recession in the mid-Thirties, a bewildering range of small luxury items poured out of the overhead workshops. Dressing cases still predominated but a whole new smoking culture grew up around the Jazz era with women insisting on jewelled cigarette cases, shagreen covered lighters, enamelled compacts and novelty match-cases. The result of the Second World War was an almost total dearth of raw materials and new goods. Inevitably Asprey's diversified and launched themselves into selling antique silver and furniture  something that must have looked particularly appropriate as the store burned 200 candles each day during the power and fuel crisis of 1947. The present Queen's coronation in 1953 signalled the start of a new boom during the 1950s and 1960s with still more acquisitions taking place in time-honoured Asprey's style. This time they took over furniture restorers Lucas and the incomparable book-binding excellence of Sangorski & Sutcliffe whose superb tooled-leather volumes of rare editions and familiar classics are a major attraction on the ground floor. Today their customers are largely from overseas. The produce becomes ever more exotic and recherché and the silversmiths are quite content to devote 1,800 hours on assembling a 42 inch solid silver model of the liner QE2 consisting of 300 separate pieces and weighing 275 ozs. Two thousand hours might be spent on a silver model of a Harrier Jump Jet, a replica of a customer's oil rig in pure gold, or a favourite vintage racing car. Many of today's items come from renowned craftsmen abroad as well. French silver from Christofle rubs shoulders with exquisite Limoges porcelain and glass from Baccarat. Backgammon boards can be plain and homely  or they may come with 9 ct gold pieces or even in ivory, all contained in a walnut-bound games compendium set costing £4,000. Tiaras come at prices like international telephone numbers, containing hundreds of 'brilliants' weighing hundreds of carats  items that only sell to customers who don't really need to bother about boring questions like 'How much?'. If, like one customer, you want a folding pocket toothbrush for use after executive lunches Asprey's will invent it for you  in a 9 ct gold telescopic holder, of course. Having trouble finding shirt collar stiffeners? Don't panic. They too can be made in gold and turn out, as one satisfied client remarked, to be the best investment he ever made as a conversation piece. But where, you must be asking is my fantasy crime-spree taking me? Well, it's all a bit disappointing really. To travel, they say, is better than to arrive and just to wander around these sumptuous collections of crafted excellence is rewarding enough. But I really must admit that one day, in my dreams at least, I'll head for that first floor luggage department where those original Asprey's leather travel cases are sold. In my dreams I'll grab one and wander innocently through that remarkable Boat House interior, wink at Mr Farra as I saunter out through his door  and hope against hope that he'll quite agree that an Asprey's travel bag is a very reasonable essential for any fantasy criminal on the run. Written for a predominantly North American tourist readership  the first draft published in place of polished version, in error.